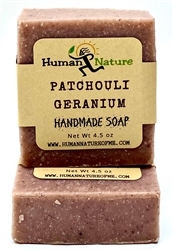 Soothe & Intensify with our Patchouli-Geranium soap from the Aromatherapy Collection. 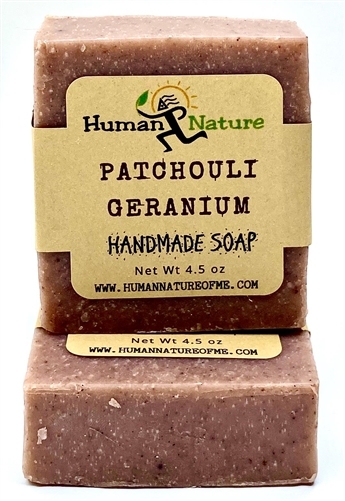 Contains: Distilled Water, Olive Oil, Coconut Oil, Sodium Hydroxide, Palm Oil, Castor Oil, Sunflower Oil, Sweet Almond Oil, Hemp Seed Oil, Cocoa Butter, Shea Butter, Essential Oils of: Patchouli & Geranium; Tocopherol (Vit. E), Alkanet Root, Iron Oxide, Pink Kaolin Clay, Ultramarine Blue Oxide (Natural Colorants).